A large-format book can be an enormous and fragile volume of historical maps, a folio of verse and sketches, or a relatively modern encyclopedia full of text and images. There are many ways a book can end up as a large format or oversized volume. In some instances, you may want a hard copy of a large format book that you keep in an archive, but in others, you may just wish to have a digital copy without also storing the original. In both cases, large format book scanning solutions can help. With a professionally made scan of the oversized book, you can get razor-sharp copies of the graphics and text, and make it a digital file available to a patron, employee, buyer or anyone else. They can go online or to an offline resource and peruse the book as if it were physically in their hands. If the book is fragile and historical, the use of large format book scanning solutions enables you to keep the book in pristine condition (before and after scanning) while offering access to all of its contents. This is a perfect solution for libraries, museums, university archives and collectors who want a book kept in climate controlled conditions, while still having access to the materials it contains. Even if the books are not valuable in a historical or sentimental context, their information can often be of use to millions. Rather than storing oversized atlases or out of date encyclopedias, digitizing their information enables you to easily store and use whatever material is of value, without dusty shelves of books to manage. If this sounds of use to you, eRecordsUSA has comprehensive large format book scanning solutions that include picking up the heavy volumes from your location, doing the scanning and digitizing, and even returning the books to you. You can enjoy online archiving and access, too, adding further benefits to book scanning of even your largest bound volumes. 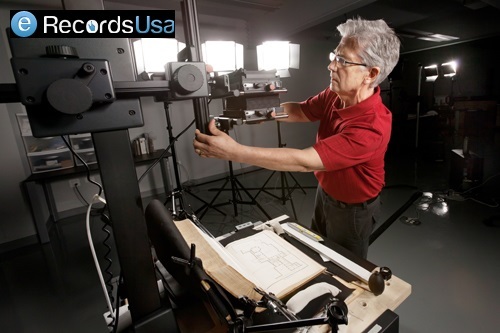 eRecordsUSA is also specialized in providing Book Scanning Service, Book Imaging Service, Digital Book Preservation Services, High Resolution Book Scanning, Legacy Books Scanning Services and more. Would you like to receive a free quote for Large Format Book Scanning Solutions? Call +1.855.722.6669 or eMail us at info@eRecordsUSA.com.